Asha Leresh, a bright high school girl, smelled a rat one day while she was collecting firewood outside her small village. A group of young boys were making fun of girls who will cry while undergoing initiation. One was holding a dirty-rusty knife. Asha stood still, carefully observing the drama acted out by the boys. They tightly held the legs of one boy while others chanted circumcision songs. Asha sensed danger. “My heart started throbbing with fear. I felt an imaginary pain.”……. One innocent boy ran towards me comforting me not to shed tears when she (the circumciser) arrives. Asha wondered about what the boy was saying. Asha composed herself and asked him what he was saying. Without hiding, he told that women were planning to get hold of her and forcefully cut her. People were planning a big celebration to have me cut and change my life to be an adult…God created me full but they want me half. Sadly enough, the firewood she was collecting was for roasting a goat at her mum’s house because she was to be circumcised. Asha ran away to her uncle’s home, but unfortunately, he was part of the team who wanted her cut. Asha’s luck came when Samuel Siriria Leadismo, the Director of Pastoralist Child Foundation (PCF) and his team visited her village creating awareness about FGM/C and sexual reproductive health. The girls (pictured) are beneficiaries of seminars and workshops held during school holidays. 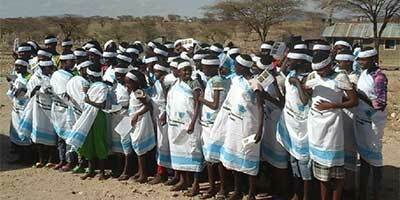 The Pastoralist Child Foundation has been their refuge and more girls in the villages are being saved. Today, Asha and 6 other girls are role models in their community, and during all school holidays they volunteer, changing the lives of other girls by advising and giving them personal testimonies. PCF has taken the initiative to give the girls secondary school scholarships and help them become ambassadors of change in Samburu.